Buy one and get one free.These tops feature high quality construction and rip prevention fabrics. Accents in Navy Digital and White & Black Camo. Arrives on or before Valentines. Click here for more details. NurseJoe's Air Force Drone Pants are equipped with 5 pockets, comfort expansion waist band, draw cord, and belt loops. Military grade and battle tested. Available to the general public for a limited time. This nostalgic American Air Force Vietnam Camouflage pattern is a gem of a find for war time collectors and military veterans. Comes equipped with 5 pockets and back cell phone pocket. The Happy Face Rank Tape ( 2 x 2 square) and the Name tape are available for you to place onto NurseJoe's Caduceus Power Top (CPT). The name tape can be personalized with up to 12 characters. Click Here for more details. The Caduceus Power Top (CPT) is a 2019 expression of the Caduceus and its legendary contribution to the healthcare industry.The snake skin camouflage pattern adds to the overall therapeutic design. Limited Edition. Click Image to Enhance. The Caduceus Power Top is a 2019 expression of the Caduceus and its legendary contribution to the healthcare industry. The snake skin camouflage pattern adds to the overall therapeutic design. Limited Edition. Click Image to Enhance. 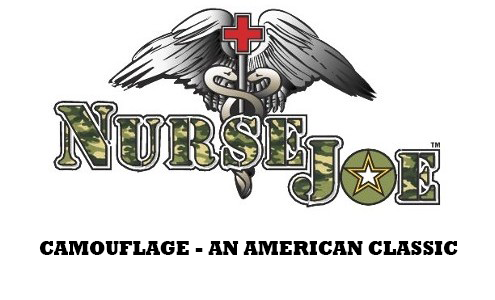 The Rank Tape ( 2 x 2 square) and the Name tape are available for you to place onto NurseJoe's Caduceus Power Top (CPT). The name tape can be personalized with up to 12 characters. Click Here for more details. Military Grade Solid Beige with Black Camouflage Accents. Unleash the Gladiator! For a limited time get the Caduceus on the right sleeve. This Chocolate Chip Camouflage pattern was used in Operation Desert Shield/Storm (the Persian Gulf War) and later in deployments to Somalia. Conda Green is part of the NurseJoe Camo Snake Tattoo Collection. Not just for Healthcare. Looks great Anywhere. Call or Email NurseJoe for Matching Scrub Pants. Buy one and get one free.These tops feature high quality construction and rip prevention fabrics. Desert Storm Camo Top & White with Navy Accents Top. Both arrive on or before Valentines. Click here for more details. Green Stat is a military grade camouflage that blends well with nature. Into the forest and over the mountains this Camo Top is ready for action. The Marine Digital Camo Top is designed with genuine military grade fabric. Four pockets standard and rank & name tape ready. No fancy packaging or colorful labels. Just a high quality American made product. NurseJoe's Marine Digital Cargo Scrub Pants are made of the same authentic US military Camouflage fabric as Our Marine Digital Tops. The perfect match. Limited Edition NWU3 scrub pants are military grade construction with five pockets and a elastic waist band, draw cord, and belt loops. Cell phone back pocket included. OCP Camouflage Medic Cargo Pants are now available for rapid deployments. With 5 pockets and comfort waist band, draw cord and belt loops you can move fast and stay comfortable. Pantera is the right choice for any occasion. This is a multicam black special ops fabric that is rare and not available in stores. Limited Edition. Manage your water supply wisely. In arid climates water is scarce. This VIP Saharid Camo Top will dry up fast. Buy Now. Sandstorm Camo is made with authentic military grade fabric. High quality stitching with strict attention to detail. Now with Complimentary Velcro Attachment Holiday Tapes! Limited Quantities.